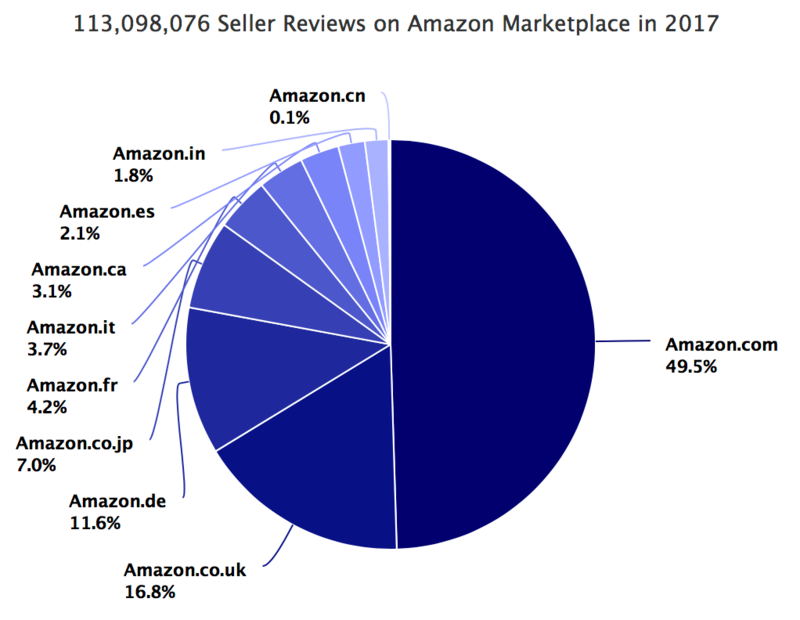 In the last twelve months 113,098,076 seller reviews were left for Amazon marketplace sellers. Each seller on the marketplace receives seller feedback reviews from customers after a purchase. That’s 309,857 seller reviews every day, 12,910 every hour, and 215 every minute. Amazon claims that sellers receive feedback reviews for 10-20% of their orders. The ratio does vary a lot more though, even going as low as 1% for some sellers (especially those not actively reaching out to buyers for a review). Over time the volume of seller reviews has started to decrease, as the rise of FBA and performance metrics has made them less important. Nonetheless the 100 million seller reviews suggest at least one billion orders by marketplace sellers this year. 50% of seller reviews were left on Amazon.com in the US, followed by UK with 17%, and Germany at 12%. This roughly matches Amazon marketplace size by country. Pharmapacks, the seller with the most seller reviews in the US, accounted for just 0.3% of all reviews on Amazon.com. Nonetheless top 1,000 sellers account for 25% of seller reviews volume, and likely sales too. Because while there were roughly 10,000 sellers with more than 1,000 reviews this year, there were more than 100,000 sellers with just 1. In the UK top seller musicMagpie accounted for 2.5% of all seller reviews. While MEDIMOPS in Germany accounted for 4.3%, and similarly momox fr in France accounted for 4.2% of all seller reviews. Overall only 4% of all 100 million seller reviews were negative. Although that does mean close to 5 million negative reviews, and thus just as many disgruntled customers. Negative reviews were the highest in India, and, surprisingly, Canada. In India 13% of all reviews were negative. Japan had the least amount of negative reviews, where instead people leave neutral reviews, which is not surprising given the rare use of negative sentiment in Japanese culture. While more than one million new sellers joined in 2017, only 6% of all seller reviews were received by this year’s new sellers. This highlights that despite the increasing growth of the marketplace in terms of new sellers, few of them every become active, and majority of the marketplace GMV is contributed by sellers who have been selling for years. If anything the number of seller reviews helps to understand the scale of the Amazon marketplace. Amazon does not share many metrics about the marketplace business, so seller reviews give a rare glimpse into the trends on the marketplace.